How would you like to whisk from the Loop to O’Hare International Airport in under 20 minutes, regardless of traffic or weather delays? High-speed express transit service to the airport has been a pipe dream of both Mayors Richard M. Daley and Rahm Emanuel. 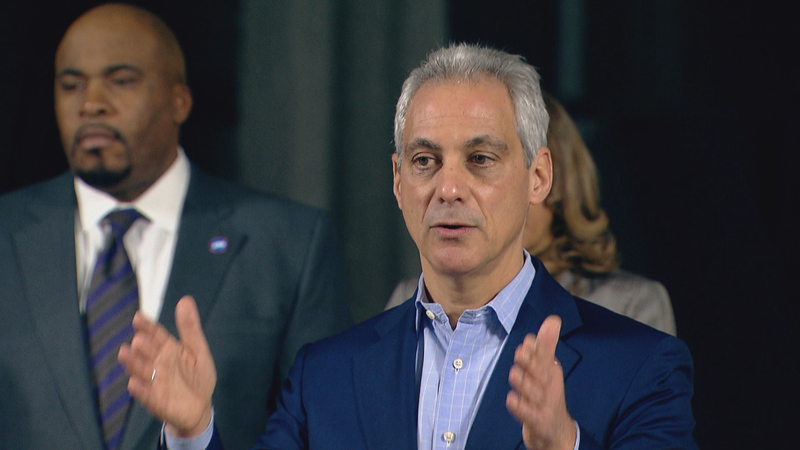 Now, Emanuel says the idea is one giant step closer to reality. But how would it happen? Who pays for it? And how realistic is the plan this time? The city is essentially outsourcing the project and formally asking companies to submit a proposal to build, operate and maintain the service. The respondents are to submit their qualifications by Jan. 24, 2018. And to make his announcement, the mayor chose to appear in the mothballed $200 million CTA superstation beneath Block 37 that was never finished. Daley at the time took an “if you build it, the express train to O’Hare will come” approach – but it never arrived. Now Emanuel says there’s tons of private money sitting around waiting to invest in a project like this, and he thinks this is the project to attract it. The city’s request is open on the question of where the express line would go – it could be built in and around existing structures like the CTA Blue Line or Metra tracks. It could be a new tunnel that’s bored from the Loop to O’Hare, it could be a new elevated structure. The technology the mayor has his eye on is the Hyperloop system that South African entreprenuer Elon Musk is heavily invested in. That’s where a pod is whisked through a tube using electromagnetic technology. Musk also owns a tunnel-boring company that supposedly can do the work for a fraction of what it used to cost. The mayor acknowledged he’s met with Musk but stresses he’s leaving the project open to anyone with any technology to see who can do it best. The ride could cost upwards of $30 for an express trip – it would have to be less than the cost of a taxi or ride-share service from the airport. But whichever company invests in this will have to recoup its costs somehow. There’s talk of other revenue streams like a concierge service or baggage-check service. One transportation expert says that while the project is no longer “pie in the sky,” the idea that taxpayer dollars won’t have to be used at some point, is. City Council would likely have to approve any deal, but the mayor and other city officials are leaving it up to the imagination of Musk and other private companies to offer more specifics. Schwieterman says other global cities have express service already and that Chicago is behind the eight ball. The mayor predicts that the number of travelers between the airport and downtown will grow 50 percent by the year 2045, underscoring his believe that it’s important to get ahead of it now. Nov. 14: The Chicago Transit Authority hasn’t raised fares since 2009. Now, the head of the Regional Transit Authority says “the time has come” to change that. Feb. 9: An express train connecting Chicago’s O’Hare Airport to the Loop and a new CTA Green Line station blocks from the United Center are among the mayor’s plans for upgrading the city’s infrastructure. Feb. 2: Negotiations are underway between the city and United and American Airlines over a new gate lease agreement that could determine O’Hare’s future development for a generation.